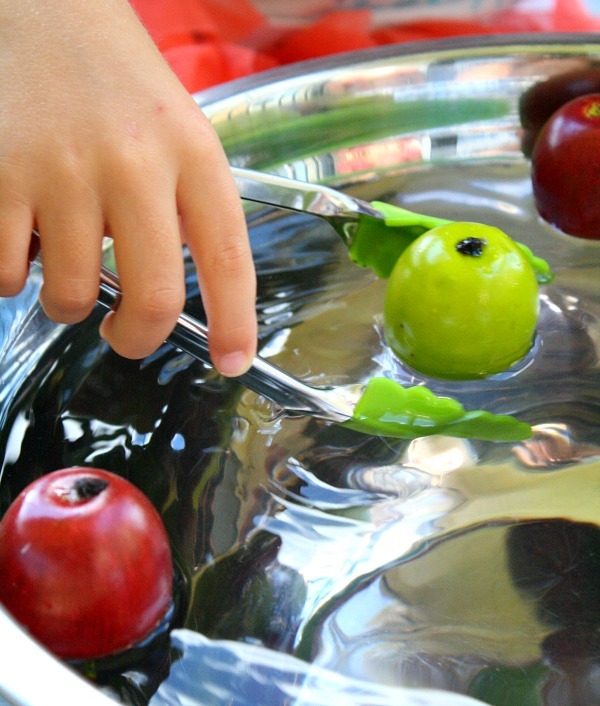 Tinker loves any activity that involves water play, so I recently set up this simple “bobbing” for apples fall activity for her. It’s a fun way to practice fine motor skills. 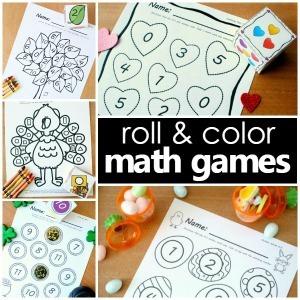 You can also incorporate counting and sorting activities with these materials. I started with a large bowl full of water. Then we added some decorative apples that I found at Walmart in the floral section. 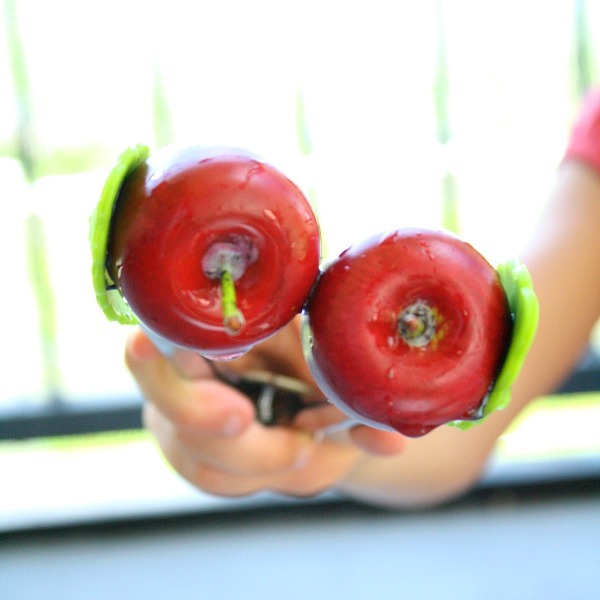 Tinker had fun uses tongs to “bob” for apples. 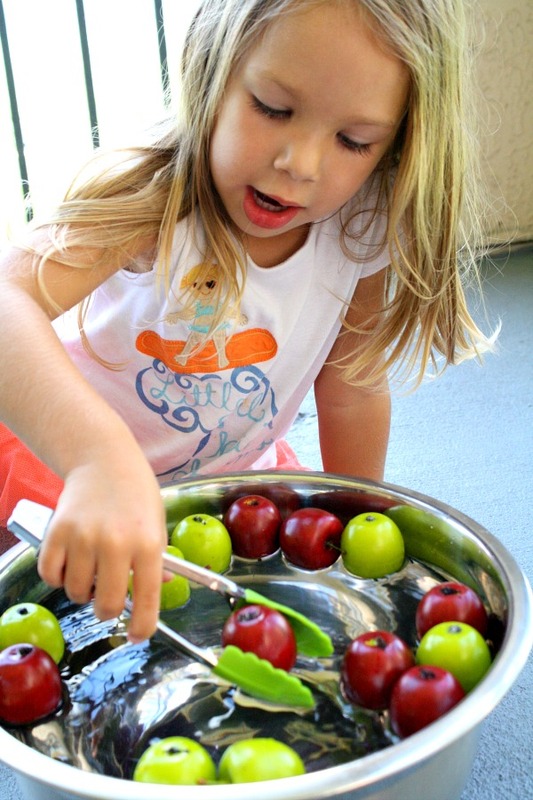 At first she simply concentrated on picking up the apples with the tongs. She was working hard! In the picture above you’ll see her little mouth was opening and closing along with the tongs–this is normal to see as kids are developing their ability to use tongs, scissors, and similar tools. Once she was more comfortable with picking up the apples, she naturally started sorting them by color. You can also invite kids to do this by setting colored bins out with your original play invitation. This activity was a bit too easy for Lovey, but she wanted to give it a try. She found it quite entertaining to try and pick up two apples at a time…which led to a lot of apples bouncing around and a lot of giggles from both girls. 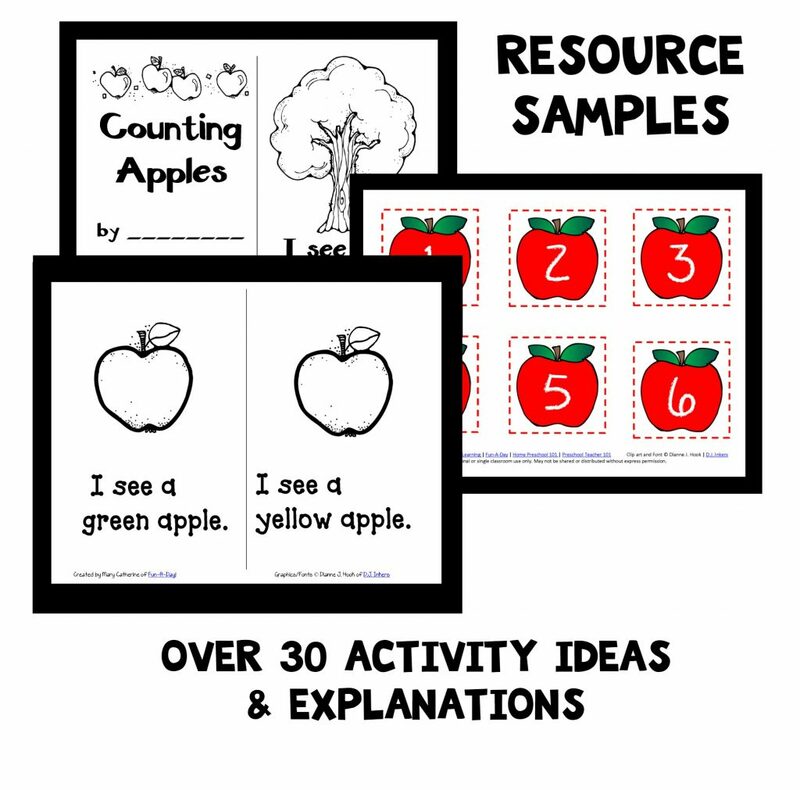 Click here to see all of our apple activities! Thank you for the awesome idea! Love it. Where do you get those apples? So glad you like it! We found these apples at Walmart, but I’ve seen similar ones at craft stores in the fall. What a great idea! I am doing an apple theme with my two middle children and they would both love this (heck, so will the older one). I am pinning this so I don’t forget! Thanks for sharing! I’m so glad you like the idea, Kalista! And you’re right even older kids find a bit of fun in activities like this. My oldest did for sure. such a fun and easy way to work on fine motor skills! 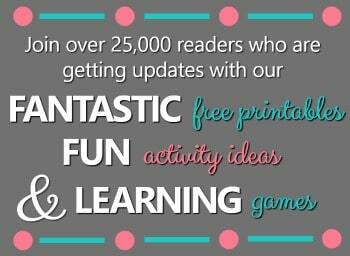 This looks like a lot of fun – I’m pinning it to my activities board. Selena @ Look! We're Learning! Thanks for this! 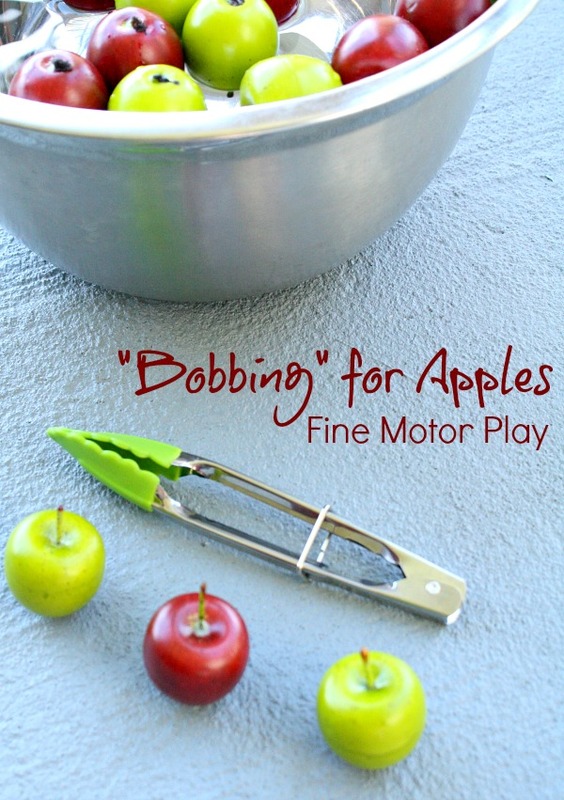 I’ve been looking for fine motor activities, especially for our youngest boy who has a hard time manipulating small objects without crushing them…lol. Pinning! Oh, I know that stage, Selena! I hope your little guy enjoys trying this one.